These are two of the first charts we do together during our Launching Writer's Workshop unit. Plus, they are just fun charts to have hanging up in a classroom. My students were impressed with my drawings. The inspiration for both charts can be found at Life is Better Messy Anyway. As we began the writing process for our first piece, we read the book, Little Monster Becomes an Author, and then created the following chart to help us through the process. I made color copies of the pages to add to the chart. 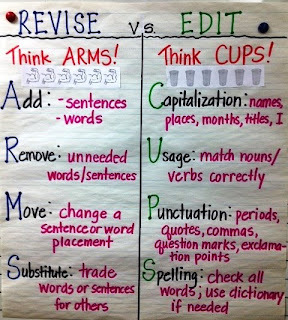 It's quickly become my favorite writing chart and we will use it ALL the time! The original post about it can be found here. 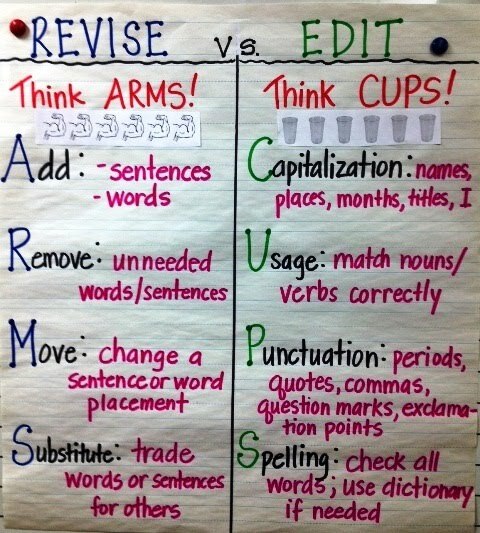 When I got to the revising and editing minilessons, we made the final chart below. The inspiration came from Confessions of a 4th Grade Teacher. I've been teaching for just about 10 years and NEVER heard of these acronyms--they are genius! I think it's safe to say that using anchor charts has changed my classroom! I'm glad you found the ARMS/CUPS useful!! I definitely have found them helpful with 4th graders! Welcome to blogland!! I am in LUV with these charts! Thank u 4 sharing! What great charts! I'm finally starting up a writers workshop model and I am so glad to have found your post with wonderful ideas! Thanks! Must Read Article for Parents!